Welcome to Adaaran Prestige Vadoo, where time ceases to exist and the voice of the Indian Ocean beckons you to her shores. 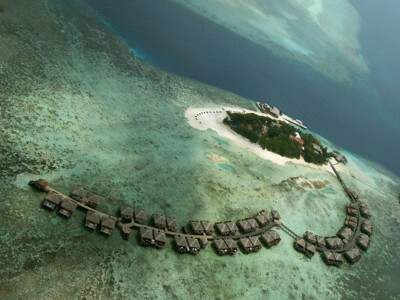 As the gateway to the South Atolls, Vadoo possesses its own exotic reef teeming with vibrant aquatic flora and fauna. A mere 15 minute speed boat ride will take you to a tropical escape that offers not only the finest creature comforts, but to a coral island that is kissed by the sun, its sands golden and soft. Awarded as the World’s Leading Water Villa retreat at the World Travel Awards in 2010, Adaaran Prestige Vadoo is honoured to stand out amongst the best. Our only hope is that we can enrich the precious moments you spend with us, to give you and your cherished ones the dream holiday that you have always wanted. 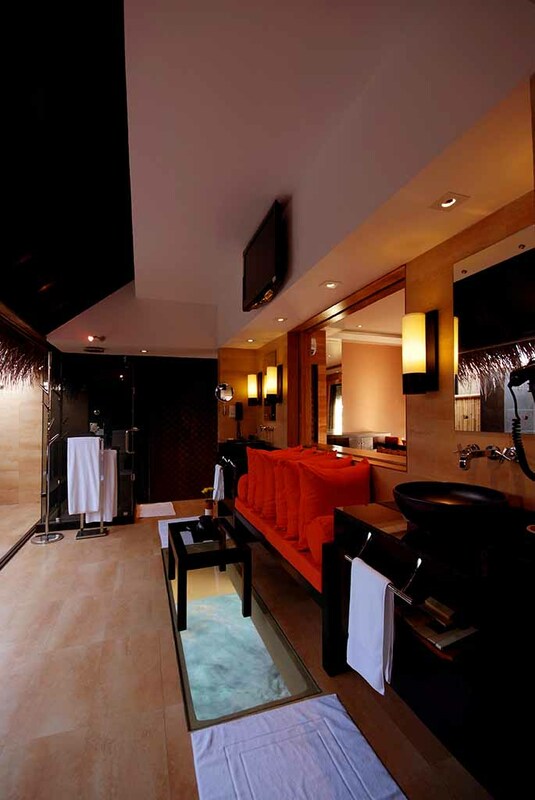 The list of indulgences that await you can only be matched by the captivating lushness of the surroundings, warmed by signature Adaaran hospitality. 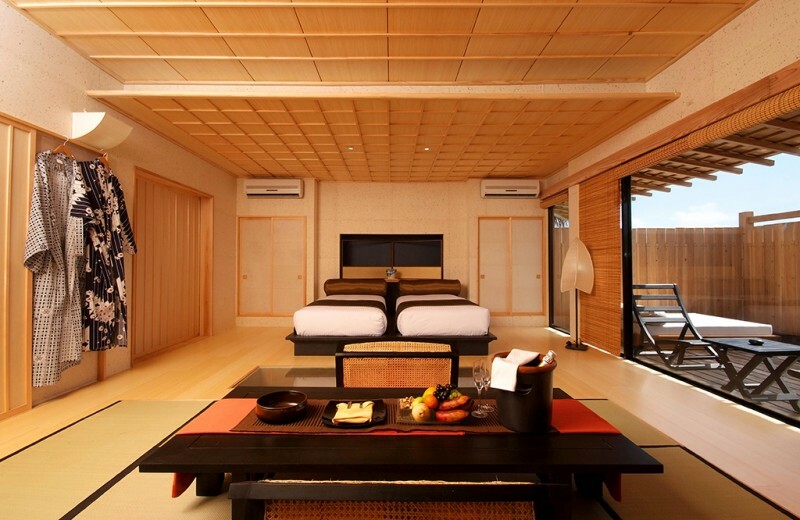 The unmistakable, aesthetically soothing tone of the colour schemes used in the interior and the precise positioning of the thoughtfully chosen furniture exudes the aura of an essentially Japanese setting. 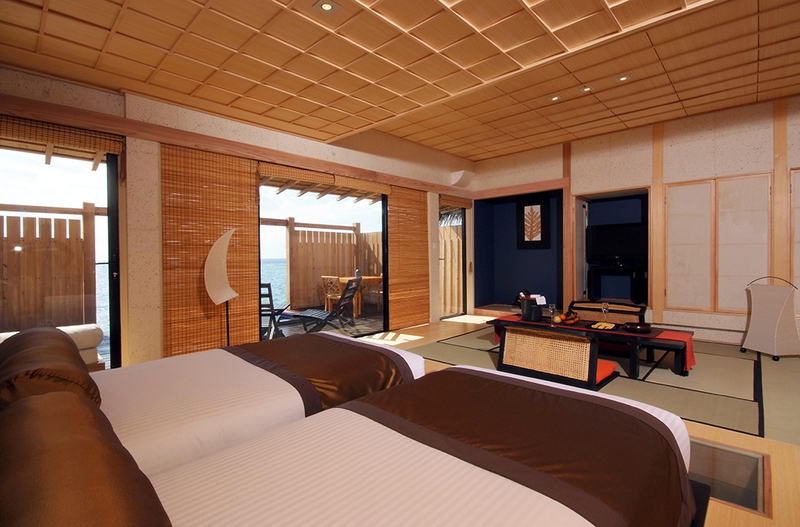 Slim into a colourful kimono and imagine you have been transported back to ancient Japan, residing in a traditional Minka on the shores of Okinawa. 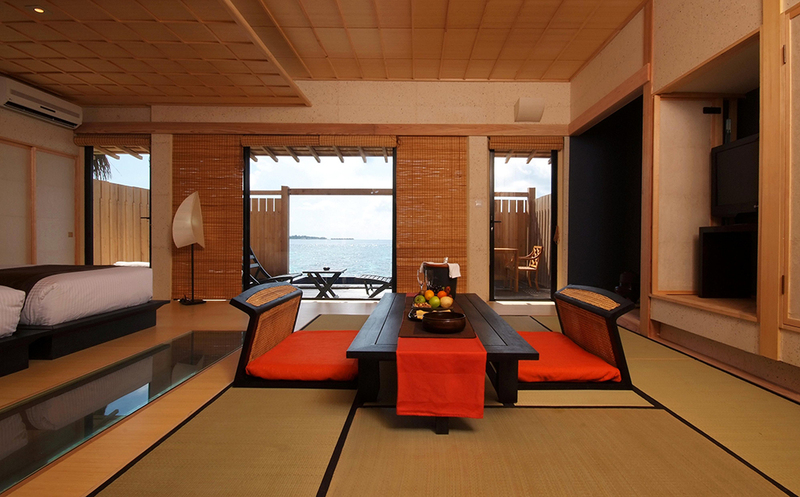 Featuring a spacious veranda these Japanese Villas are perched atop the glistening turquoise waters of Vadoo. 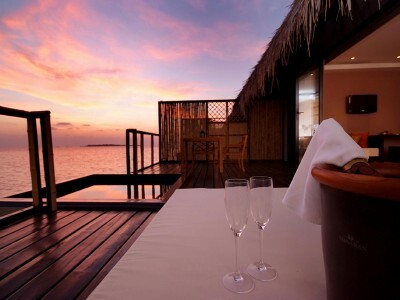 Celebrate your commitment to each other in style by staying at an elegant Honey Moon Villa at Adaaran Prestige Vadoo. Arrive via chauffeured buggy while our dedicated staff help settle you into your romantic retreat for the duration of your holiday. Enjoy chilled champagne as you watch the sunset, snuggle on the cosy king size bed or relax with your significant other in the luxuriant plunge pool. 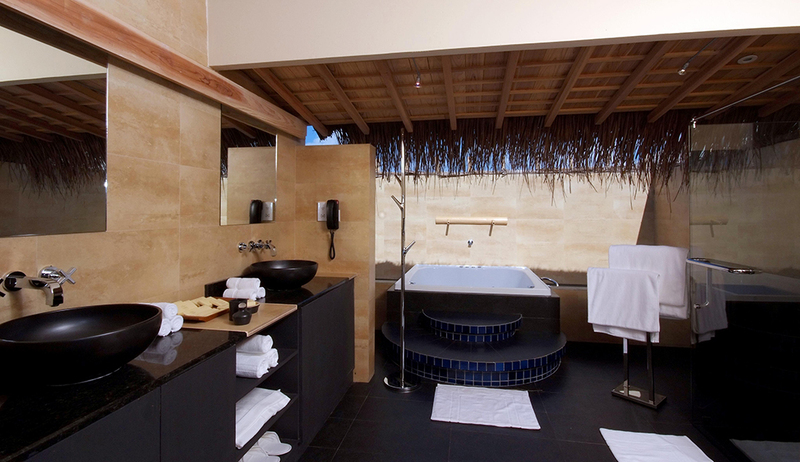 Honey Moon suites feature wooden floors and decor complimented by colourful tropical themed linens and traditional style thatched roofs for that traditional beach dwelling feel. Dip your feet in the endlessly clear waters thanks to exclusive access to the beckoning seas via a private stairway. The accompanying sundeck and its lounge bed let you soak up the rays while sipping a chilled cocktail admiring the clear blue skies. In the night the deck transform into a picture perfect venue for a romantic dining experience under the night sky illuminated by dazzling stars. Discover a riveting fine dining experience that will expose your taste buds to a multitude of enticing flavours from Asian specialities to ingenious fusion creations. Enjoy the freshest seafood delivered everyday from the waters around the atoll. Savour sumptuous lobster or succulent fish delicacies prepared to perfection under the guidance of our experienced culinary team. Sink in to the plush, warm setting of the restaurant with scenic views over the ocean as you enjoy a delicious meal and pristine service. 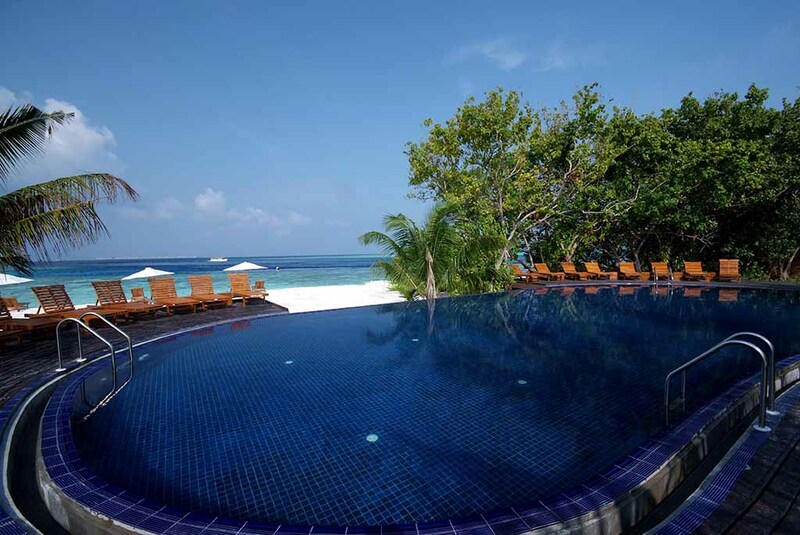 In the evenings enjoy soft music and gaze out at the moonlit ocean, Farivalhu has strived to blend traditional Maldivian aesthetics with modern design. 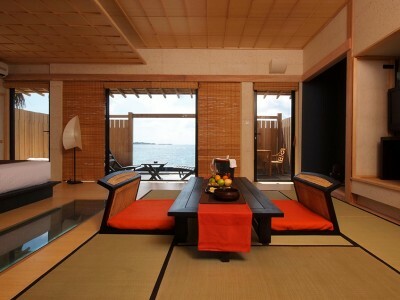 Adaraan Prestige Vadhoo is unique in the Maldives to offer a Japanese specialty restaurant. For those wishing a change of taste and scene you can try traditional Japanese meals ranging from fresh sushi to succulent tempura at the Kithajima restaurant. Our staffs have had many years of training and experience in the preparation of Japanese cuisine and will endeavour to prepare your selections to suit your preferences. Traditional Japanese favourites ranging from edamame and spring rolls to sushi, tempura and sashimi served with specially made sauces and accompaniments are just some of the dishes on offer to satisfy your cravings. Only the freshest of seasonal sea food and best ingredients are used in the preparation of the dishes. Many Japanese beers and Sake is available to enhance the dining experience. 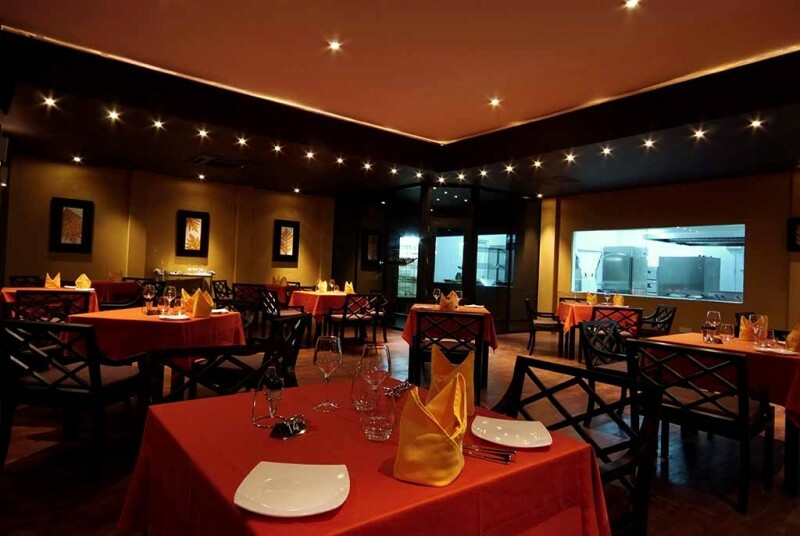 The restaurants decor boasts a fusion of both modern and traditional design elements, creating an intimate setting for a lavish dining experience. 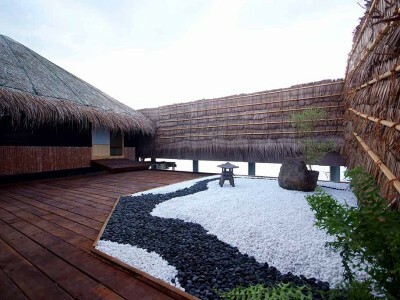 This is the place to quench your thirst after soaking up the warm tropical sun or after more energetic activities. Sip a cup of freshly brewed tea at any time of day or enjoy a cocktail or our many juices and soft drinks to cool you down in the noon heat. Partake of light refreshment in between meals to stave off hunger pangs after lazing in the sun or in the warm azure waters. Return later in the evening to watch the sky turn into shades of pink and orange and even red as the sun sinks low over the Indian Ocean. Relax with your special beverage and be at one with nature. Intermingle with other guests and meet new people, take an evening swim if your mood permits and make your mornings and evenings at the resort special. 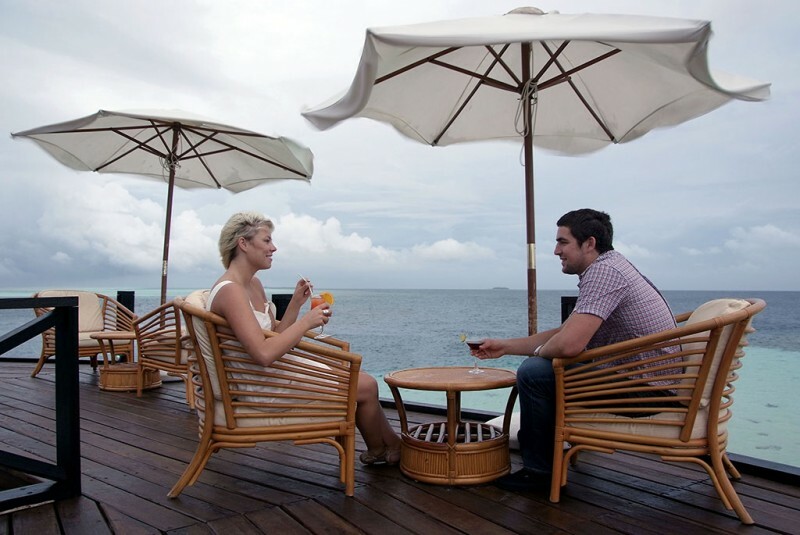 Set in the secluded waters just off the island, the Main bar is in close vicinity to the water villas and offers a captivating spot to enjoy a drink with friends or loved ones. Featuring a three sided wooden deck looking out over the infinity of the Indian Ocean it makes for a mesmerising venue day or night. Gaze longingly into the vastness of the ocean as you sip a refreshing cocktail under the clear night sky as the waters lap the fringes of the shore. We have strived to ensure that wide arrays of prominent and select beverages are available as per your taste. Let the practices of traditional therapeutic methods naturally purify both body and mind to formulate a purifying spa experience enhanced by the relaxing atmosphere of the lush surroundings. 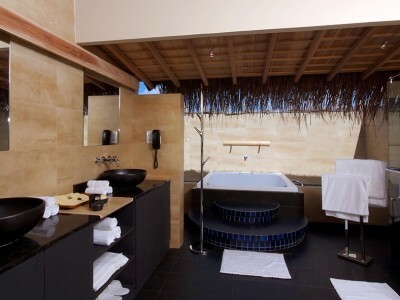 Expose yourself to a myriad of cleansing and rejuvenating treatments offered by Coconut Spa. 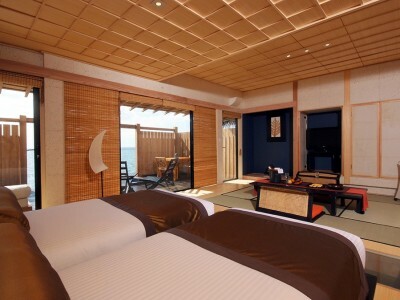 Experience an incomparable sense of tranquillity as you feel the healing touch of our experienced therapists. Liberate your senses with our unique range of massages which utilize the use of several conventional therapeutic techniques in addition to Warm Stone Massage Therapy, Black Stone Massage Therapy, Sea Shell Massage Therapy among others. 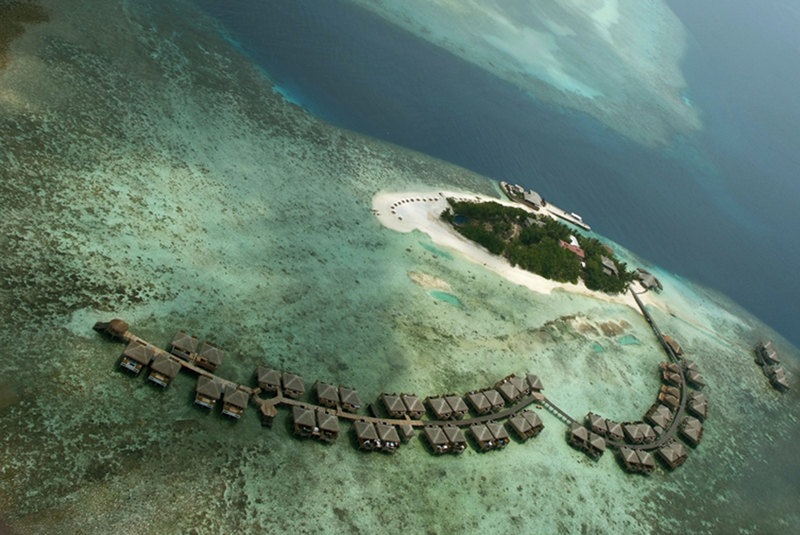 Our team of staff is professionally qualified and posses intimate knowledge of the surrounding ocean and its atolls. Go on a guided journey with them and discover the unique sights and sounds of the Maldives. With clear sunny skies prevalent for most of the year, there are a variety of activities to partake in from water sports to exploring nearby attractions. Perfect for nature lovers, embark on an unforgettable journey on a Whale Submarine Adventure as you dive into depths of the Indian Ocean. Be amazed by the underwater treasures of Maldives as an explosion of diverse marine life unfolds before your eyes. 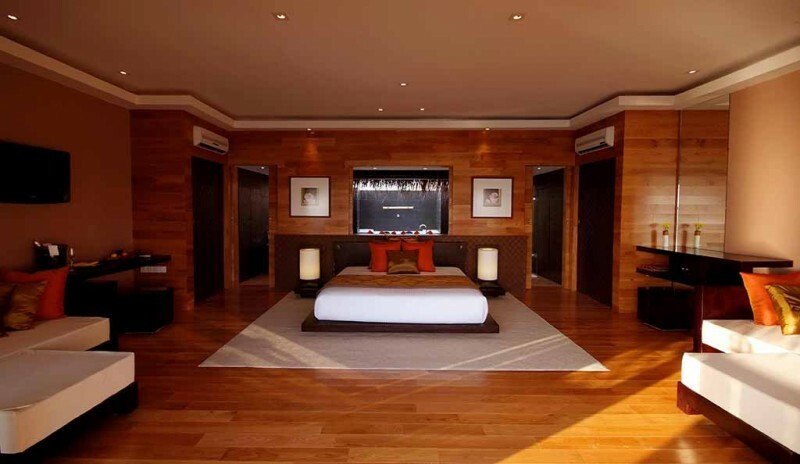 Revel in the vast expanse of sandbanks tucked away amidst the cluster of Islands. Indulge in a scrumptious lunch whilst you surrender your senses to the simple nature of the pure white beads of sand that surrounds you. Inviting you on a true sunset experience, gaze at the spectacular phenomenon and capture the different, yet vibrant shades of the sky as it changes colour. Take as many pictures as you want in one of the many photo flip excursions and relive its epic moments. Enjoy a spectacular bird’s eye view of the splendor of Maldives while you journey on a Seaplane, It’s guaranteed to be an experience of a lifetime. Ever wished you and your partner were the only people in the world? 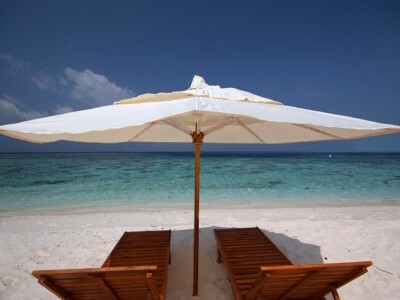 Here is the chance to experience such a feeling on our reef snorkeling & picnic lunch. 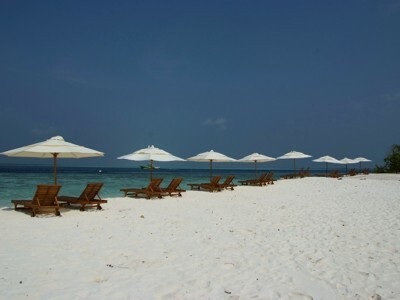 Only you, surrounded by the sapphire sky and the emerald waters with your lover or family on powdery sand lagoon , enjoy a picnic lunch .One of our exclusive activities that you should not miss. Avisit to the underwater world in the state-of-the-art Whale Submarine, the deep diving largest passenger submarine in the world that takes you on an underwater adventure at 120ft below the surface. 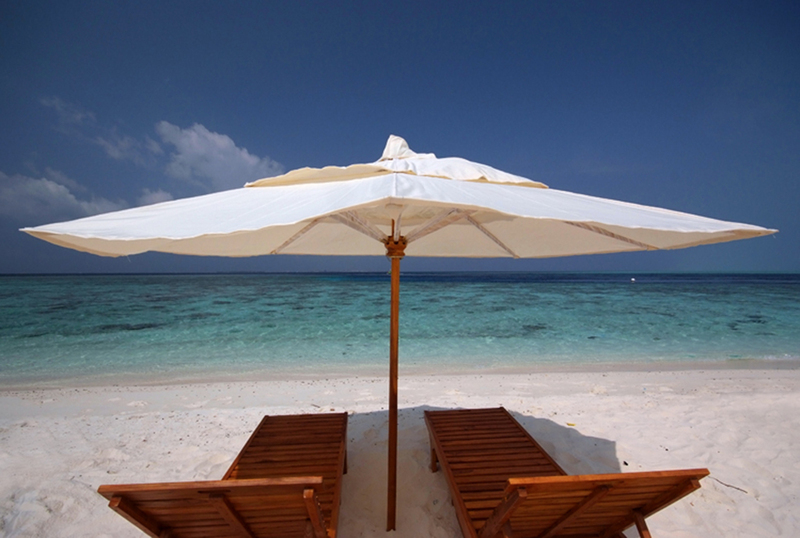 A Maldivian Holiday is not complete without a visit to a designated Picnic Island or an uninhabited island and experience nature in perfect harmony. 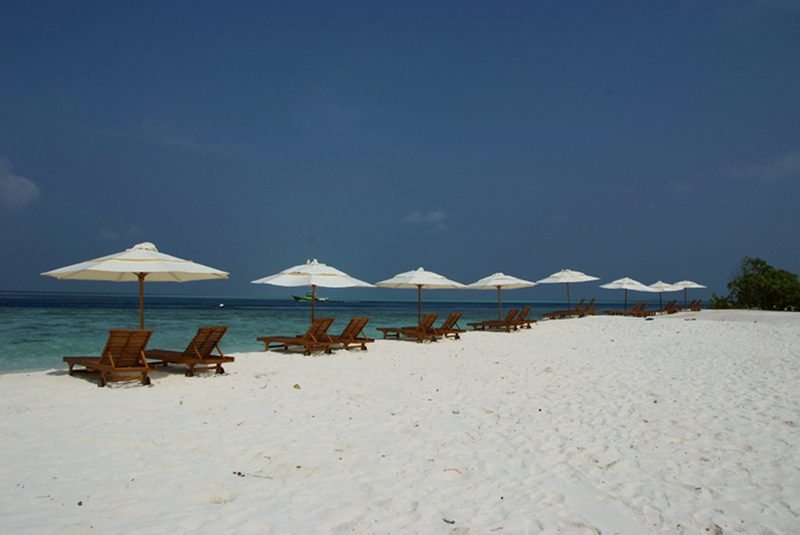 Spend a day in the clear waters of a deserted island, swimming, snorkeling and experience a barbecue on the beach. The seclusion & untouched beauty of these islands even attracted visitors who crossed these seas even in the past. For a better insight of the local life, an excursion to an inhabited island will be ideal. You will see the men at work, the children enjoying themselves and the women busy with their chores. The Male’ Tour is unique. Male’ must rank amongst the smallest capital cities of the world. Explore the streets of this tiny & unique island city through a guided tour by experienced local tour guides. Watch the fisherman unload their catch at the bustling local fish market or wander the aisles of the colourful Maldivian consumable products at the local market. 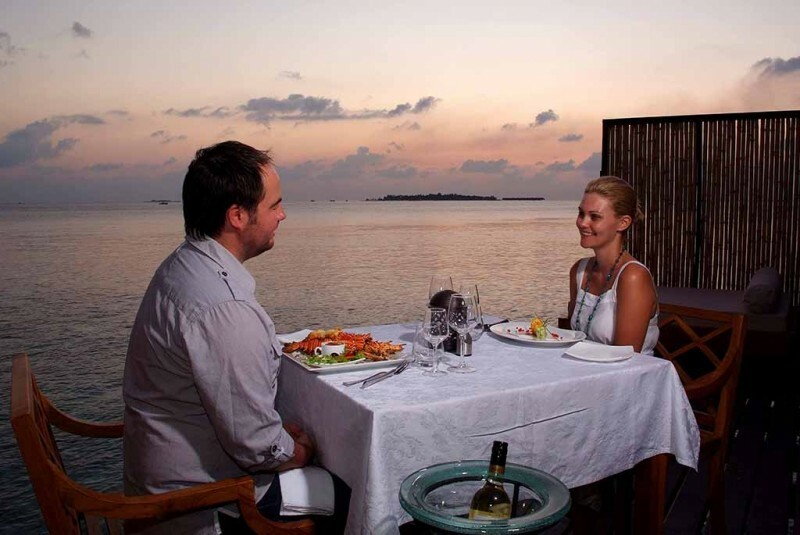 Learn about the history & culture of the Maldives by visiting places of interest in the city. Although Male’is not the shopping capital of the world, you will find plenty of enthusiastic vendors keen to show you around their souvenir shops. such as waves, currents or the difficulties in entries and exits of the reef. It is advisable to take adequate precautions against the sun; the deceptive cool of the ocean may increase the chances of sunburn. Your visit to Adaaran Prestige Vadoo is not complete without trying your hand at the local pass time activity- fishing.This is definitely a night to remember full of scenes and memories. Bait your hook, drop your line direct from a ‘Dhoni’ to the reef edge & hope for a nibble as you watch the spectacular colors of sunset & ocean waves lap the surrounding islands.The fish caught by you could be prepared to your liking for dinner the next day. Bu adada Maldivler’de yapılmış ilk su üstüne yapılmış villasını görebilmeniz mümkün. Yani bu adada küresel ısınmanın etkilerini görebilmeniz mümkün, çünkü çok gözle görülebilir bu doğa olayına şahit olabilirsiniz. Nasıl mı? Yıllar için de ilk yapılan bu villa suya daha yakın hale gelmiş, suyun yükselmesiyle. Eğer buna şahit olmak isterseniz listenizde burası da olmalı. Ayrıca balayı için gelenler balayı odalarında çok güzel ve özel bir döşeme ve mimari ile karşılaşıyor. This is relatively a small resort with around 50 villas. It is 20 minute ride by speedboat from Male. What makes this place unique is that all accommodation in this island is on the water; that is water-villas. 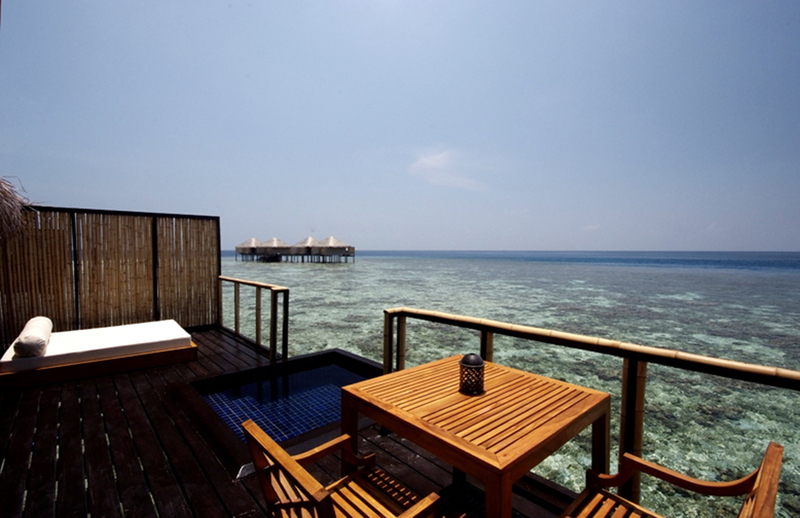 And, here comes the special part: They have the very first water-villa in Maldives. The unfortunate fact that water levels are rising due to global warming can easily be observed here. 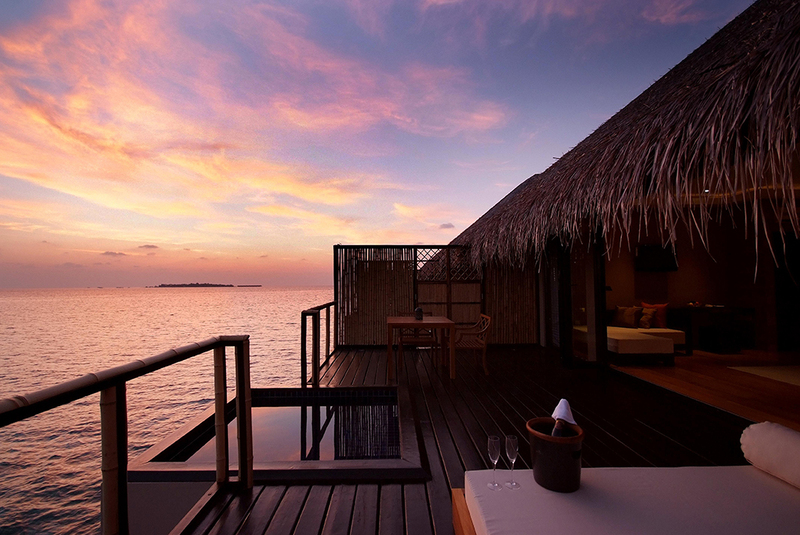 They are keeping one old water-villa among other new-built villas. This one villa you can see is at a much lower level than others. 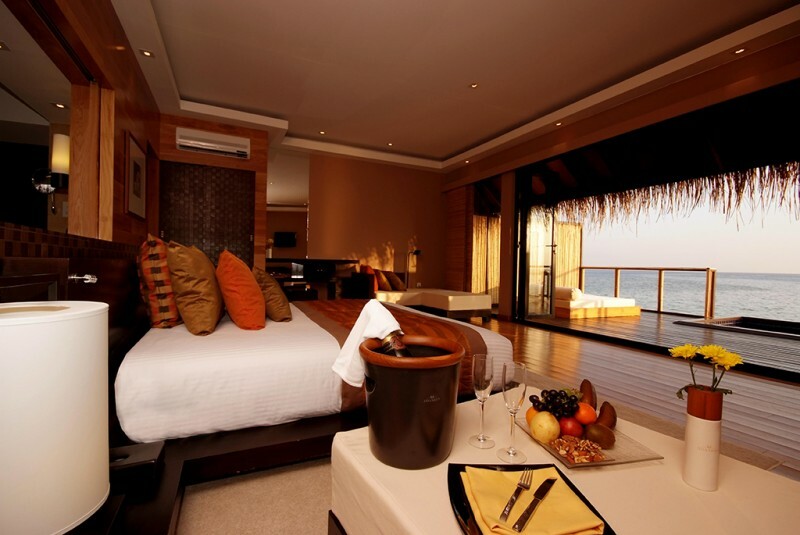 The special feature of all villas having glass-bottom adds to your feeling of ‘floating’. They also have private swimming pools which is a big plus. 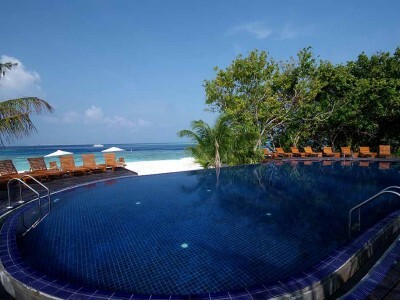 You also have direct access to the ocean from you villa. Depending on your taste and what you enjoy watching more, you can choose among ‘sunrise’ or ‘sunset’ villas; which mean you will have the chance to see the sun in different times. 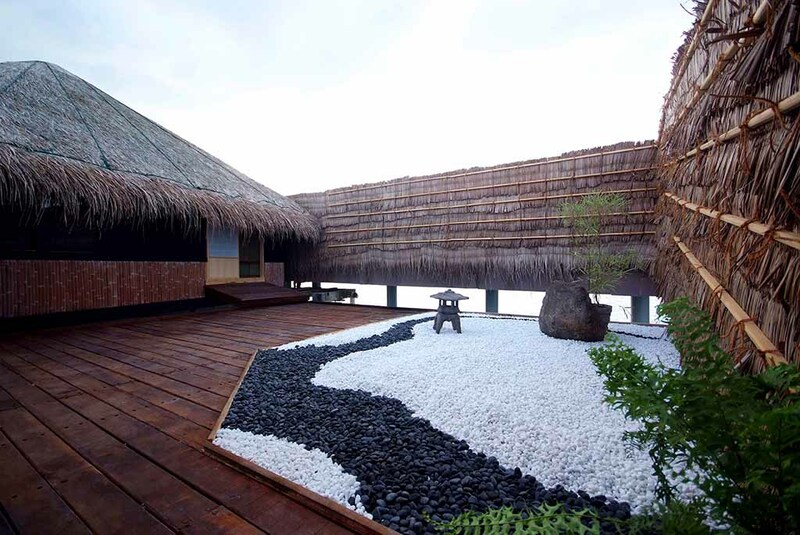 In the very unlikely event of being ‘bored’ in your villa, you can go around the island and visit the 6 magnificient Japanese Gardens. There is also a big common swimming pool, usually empty due to everyone having their private ones. But yes, you may enjoy the big pool by yourself only too while everyone else is enjoying their private pools.